UNESCO declared the historic part of Valparaíso a world heritage site in 2003, and when you get here, you won’t wonder why. It’s been called the Jewel of the Pacific, or Chile’s version of San Francisco, but there’s really no comparing it to anyplace you’ve ever been, and you’ll just have to come see it yourself. The city is split into two main parts, the first of these being the “plan” or flat section, where you’ll find the port, the bus station, the market, and pleasant Muelle Barón (a pier) where you can sit and enjoy the view of the water. The second part, the more eye-catching bit, is the series of hills on which most of Porteños live. There are lively (and connected) Cerro Alegre and Cerro Concepción, where there are cafés and restaurants and places to stay, and the Paseo Gervasoni where some of the best views are had. Of course, you could walk up the hills, or for about fifty cents (or less), take one of the acensores (as the funiculars are also called) that will take you up top. Getting down is easier, just walk toward the water. Though you can take a driving tour of the city, it is best seen on foot, as many of the murals and brightly colored houses and staircases are best appreciated from street level. Wear sturdy shoes and treat yourself to a snack with a view when it’s time for a rest. Enjoy a performance by ‘Voces de América’ (America’s Voices) and the ‘Thiare’ ballet during this 3.5-hour combination dinner and a show experience in Santiago. Dig into an included three-course dinner of international fare as you enjoy an extravaganza of typical dances from Chile’s northern, central, and southern regions, plus Easter Island. This scenic full-day tour takes you to Valparaíso, Viña del Mar, and the wineries of the Casablanca Valley. 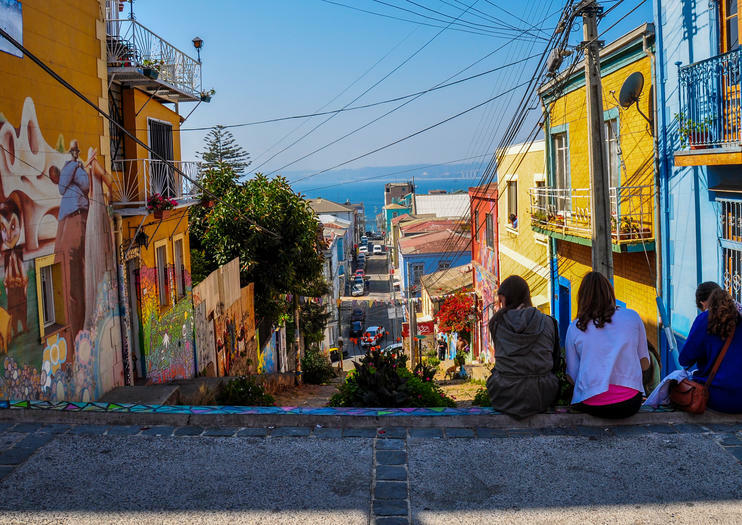 Marvel at the colorful houses of Valparaíso, including La Sebastiana, once home to Nobel laureate Pablo Neruda. Sample crisp white wines in the Casablanca Valley and visit the famous Flower Clock in Viña del Mar, deemed Chile’s “Garden City” for its many green areas. You’ll experience the best of these beloved areas. Experience Valparaiso area highlights—from the UNESCO-listed city center to surrounding Casablanca Valley wineries—in just a few hours on this Valparaiso or Port San Antonio pre-cruise excursion. Since you won’t have to worry about arranging transportation among destinations, you can relax while you hear informative commentary from your guide about the Valparaiso area’s most popular attractions. Discover Chile’s cosmopolitan capital and tour a celebrated winery on this 8-hour excursion. Trace the events of Santiago’s past as you visit the city’s colonial center and contemporary financial district. Visit monuments and admire panoramic views from Santa Lucía Hill. Head to Undurraga Winery to taste premium wines and explore the gardens, cellars, and a museum on Andean culture before concluding your tour in San Antonio. Explore Santiago, Viña Del Mar, Valparaíso, and the Casablanca wine region on this 2-day tour. Spend a half-day touring Chile’s cosmopolitan capital city, with stops at the Equestrian Club, Santa Lucía Hill, La Moneda, and more. Visit Viña Del Mar, affectionately known as the “Garden City” for its extensive green areas. See the hilly streets and funicular elevators of Valparaíso and sample delicious wines at vineyards in the Casablanca Valley. Explore the flower-lined streets and lush green areas of Viña del Mar, Chile’s “Garden City.” Visit Valparaíso, a UNESCO World Heritage Site known for its charming funicular elevators. Tour the Casablanca Valley wine region, stopping at vineyards to taste local wines and olives. This customizable excursion allows you to build an itinerary of celebrated wineries like Undurraga, Santa Rita, and Concha y Toro. This tour is a unique option for those how want to discover authentic Valparaiso and be sustainable at the same time. Walk and move like "porteños" with a savvy local guide using funiculars and trolley bus for less pollution, not only visiting the very touristic places but also the undisguised angles of the harbour. We are committed to working together with Fair Chile Foundation to lower the carbon print by planting a tree for each of our guests. So, YOU are a proud part of it!! !